Unlike products you can take off a shelf, box and ship, all of our products are custom made just for you. Because of this, we need some time to print before they ship. Most orders will ship the very next day. Exceptions might be extremely large quantity orders, or special material items. While we do have backup machines for all our production methods, rarely we may have mechanical equipment failures that could delay your order, You will be notified in these situations to work out a solution that works for you. Most items will ship within 24 hours of ordering. The date your receive your item will depend on the shipping method chosen. 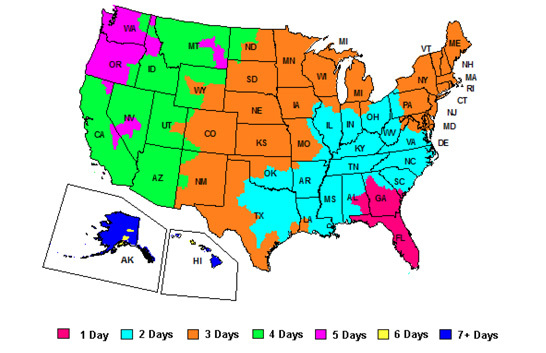 The FedEx Ground Time-in-Transit Map below provides the number of transit days for delivery via FedEx ground services within the 50 states and Puerto Rico. For expedited shipping, select 2-day or next day shipping options. NOTE: Business Days are Monday through Friday, excluding holidays observed by FedEx. Upon completion of your order, you will receive a shipping confirmation email which will include your tracking number for you to track the delivery of your order. Watch Video Upon completion of your order, you will receive a shipping confirmation email which will include your tracking number for you to track the delivery of your order. We offer same day shipping for a fee. If you order by 10am, we will print and ship your order the same day. This often requires us to keep employees, late or overtime, so we charge anywhere from $50 for small orders to $300 for larger orders- depending on the quantity. Often this is less than expedited shipping so can be a savings in some situations. Past the 10am same day cutoff or the 5pm next day cut off? Just call and ask -sometimes we can work with you depending on our production workload. We will do our very best to accommodate your deadlines!